Central Queensland - On the way from Townsville to Emerald, Blackwater is just off the Capricorn Highway. Primarily a mining town, with the introduction of the electric train line, its actually difficult to tell that the town is focused on mining. Two places to visit in Blackall itself are the Japanese Garden Complex, celebrating the twin sister city relationship it has with Fujisawa in Japan. Also located within the complex, is the Mining Museum, with mining equipment on display, and exhibits relating to the history of mining. Located at the restored original railway station - Blackall Tourist Information Phone +061 7 4657 4637, Shamrock Street. 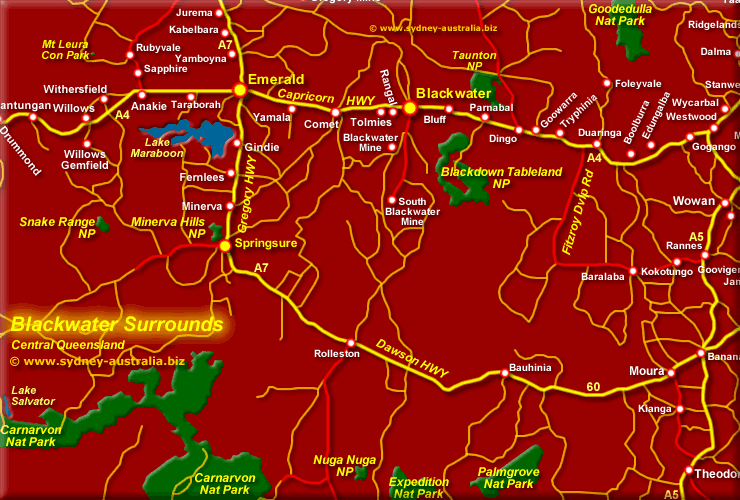 Nearby, is the Blackdown National Park in the beautiful Blackdown Ranges. This park offers stunning scenery and waterfalls Other parks, including Goodedulla National Park, Carnarvon NP, Expedition NP and Palmgrove NP are within driving distance. West: Emerald, with Sapphire just to the north of the map, are places where you can fossick for gems. To the East, the Queensland coast north of Townsville to Cairns and beyond is a region of stunning natural beauty, encompassing two World Heritage areas, the Great Barrier Reef and the Wet Tropics. Capricorn Coast and the Cairns and Far North Queensland. About jobs, work and employment in Australia: Work in Australia - Jobs. Queensland accommodation includes hotels, motels, luxury resorts, caravan parks, camping, bed and breakfasts and farm stays. For Australia wide hotels and other accommodation, see Hotels in Australia.